Home » Being A Wordsmith » Are You Sure You Want Me To Answer That? I make lists and then I ignore them. I clip coupons and then I forget them in the car when I go to the store. I hold my stomach in…A LOT. I record Young & The Restless every week day. I do a lot of friggin’ laundry. I enjoy Twitter, Facebook, and Pinterest. I drink boxed wine even though I prefer the good stuff. I pray and express gratitude for Hubby and The Deuce. Outside of your job, what do you do? I would be the first buyer! Thank you for stopping by, Ida. Lol!!! I have an envelope labeled “coupons.” Does the fact that some of these expired in January tell you anything about me. Lol. I love this. Andrea @ be-quoted.com visiting from SITS. Same here. I printed some coupons today because one of my fb friends posted her store receipt where she saved 50% on a $200 grocery bill. It can be done. And when you start adding those savings over a year's time…it's amazing! More bang for your buck–that's right! And Hubby will drink it out of a mason jar if I let him, so I'm not going to spend good money on a nice bottle of red. You and I had the same quote for Day 4 of the challenge! Thanks for connecting with me, Sunni. Very funny. I can relate to your lists and coupons because I do the same thing. I also drink boxed wine because you get more bang for your buck, I buy the good stuff if people are coming over. 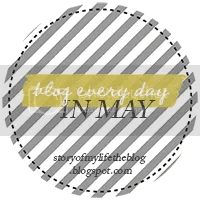 I found you on another blog that is participating in the May challenge. You sounds like someone I would totally get along with 🙂 Love it! A couple of glasses of that boxed wine does the trick. Thanks Kate! Love the way you answered this. I watched Y&R for years all the way through college! I started watching too many prime time shows and reality shows after school and just couldn't keep up any longer. Love me some Victor Newman though! If you have SoapNet in your area, check it out. I record Y&R on that channel instead of CBS, because it shows the original airing. If there is a break in the news or some sort of pre-emption, I still get the entire episode. I love these. I have so many lists and coupons I don't use. I managed to print some coupons today. Next step is to clip them, organize them, put them in my car, and then take them in the store. Whew! Love your Kentucky Derby Fashion review. You nailed it. Thanks for stopping by. I laughed out loud at the first two. That is so me! Those are the two I typed out quickly with no hesitation.